And when times got better for them, the city breathed them back out again to leafy suburbs, or market gardens. Or, if things got tough, London spat them back out to rural poverty and destitution; one recent fact that’s emerged was the death from ‘delirium tremens’ in the Hemel Hempstead workhouse of my Hertfordshire-born great, great grandfather. After a life in service in London he returned to his home territory to a miserable end aged 58. So here, after all, is the record of ‘My Day Out in London’ interwoven with the subsequently discovered family stories that may resonate with other people’s histories too. Several things had prompted this visit to London – we were staying at my mother-in-law’s near Watford and were reminded that her mother came from somewhere in the East End – she doesn’t know exactly where, Victoria Park, Bethnal Green? I remember her quite fondly as an elderly woman (she died in 1975) – an ever-cheery, round soul (photo at end of post) with a soft spot for her grandson, my other half. This stirring of interest in seeking her old territory provided one nudge, compounded by memories of a few visits we’d made in the early 70s to the markets she used to talk of going to as a young woman – Petticoat Lane for clothes and fabric, Dalston for fish and meat, Club Row, where family pets were bought, and Brick Lane for fruit and veg; we fancied going again. So, on a sweltering hot June day we wondered along Petticoat Lane where I bought a cheap and cheerful scarf in the market, took a look in one of the many textile shops full of vibrant coloured and patterned fabrics, and ate in a ‘de rigeur’ hipster canteen in the restored Spitalfields market. The inscription dates back to the building’s origins as a Protestant Chapel built by the French Huguenots who had fled from France in the late 17th century to escape persecution from the Catholics. They arrived with little but their religious commitment and their working skills and as many of them were silk weavers they set up their small scale industries in their homes. 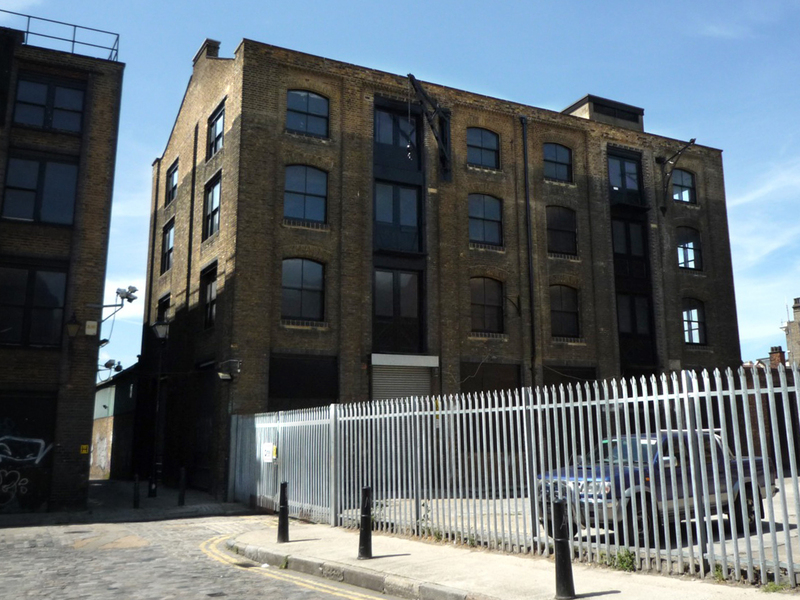 By the early C19th their success allowed them to build terraces of houses with large windows to provide workspace for the weaving but as a community they’d constructed their own place of worship on this site not long after their arrival. This chapel, “La Neuve Eglise“, replaced the smaller original building in 1743 but their dissenting Calvinist beliefs made them unpopular here too and by way of expressing the authority of the established Church of England, Nicholas Hawksmoor was commissioned to design, in English Baroque style, Christ Church which is only a few hundred yards from La Neuve Eglise. After a decline in the linen industry in Ireland, the French Huguenots were joined in their silk trade by Irish emigrants who settled in the area (more came in the mid 19th century as a result of the potato famine). 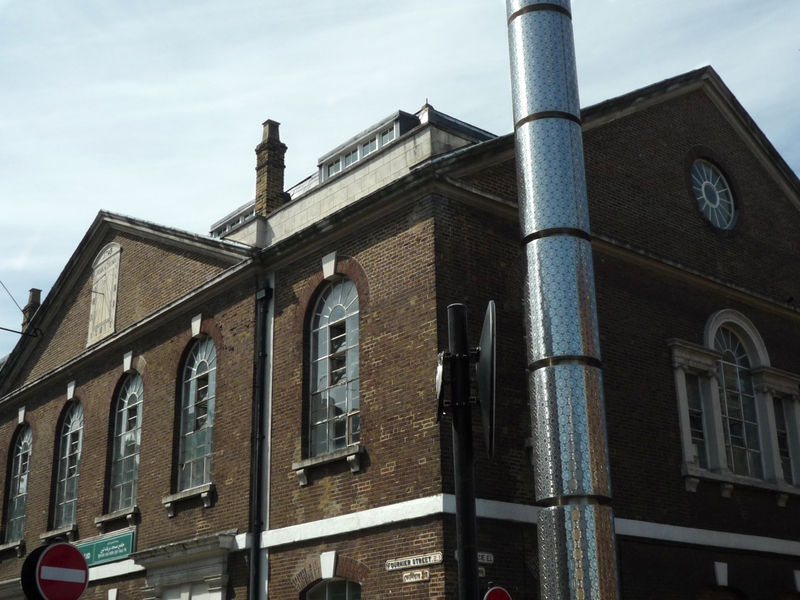 Early in the next century the building became a Methodist Chapel, then in the 1890s the Spitalfields Great Synagogue took over the chapel as Jewish refugees, also escaping persecution, this time in Russia and Eastern Europe, moved into the area. By the mid 19th century Spitalfields had fallen into decline and became one of the most violent and dangerous places in London, notorious in the 1880s for ‘Jack the Ripper’s’ brutal Whitechapel murders of prostitutes. Jack London’s non-fiction book The People of the Abyss covers the dismal conditions and life in this area in the early 1900s and is a real eye-opener. Although the silk weaving had largely gone by the early 1900s and new trades had moved in – such as cabinet-making and tailoring – textiles were still a feature. By the mid 20th Century much of the Jewish population had moved out to the North London suburbs to be replaced in the same business by emigrants from Bangladesh, and to serve this new community’s religious needs the New Church became in 1976 the Brick Lane Jamme Masjid mosque. These radical shifts of the building’s use over two and a half centuries are emblematic of the ebb and flow of immigrants and settlers to this dynamic part of London. After this visit I learned that some of my great, great grandfather’s siblings, nephews and nieces had also moved from Hertfordshire to Dalston, Hackney, Shoreditch and Bethnal Green as shoe and hat makers, carpenters and brick layers, making more of a success of their lives than he had – some of their descendants were amongst those re-locating to the leafy suburbs of Hampstead and Highgate. Another, slightly odder, reason for the trip was hearing a radio programme in April about Jocasta Innes, who had just died. She, along with Dan Cruickshank and others, had fought to save from demolition streets full of the handsome 18th century Huguenot silk weavers’ houses and lived in one until her death; the multiple identity building that became the mosque was at the end of her street. I’m not aware how she is perceived these days but her 1970’s Pauper’s Cookbook and Pauper’s Homemaking Book offered some imaginative but sound approaches to sustainable living that have much relevance now. The salvation of the houses in the 1980s was also inevitably the start of the gentrification process, ultimately pricing local people out the area and creating the up-market version you see today. 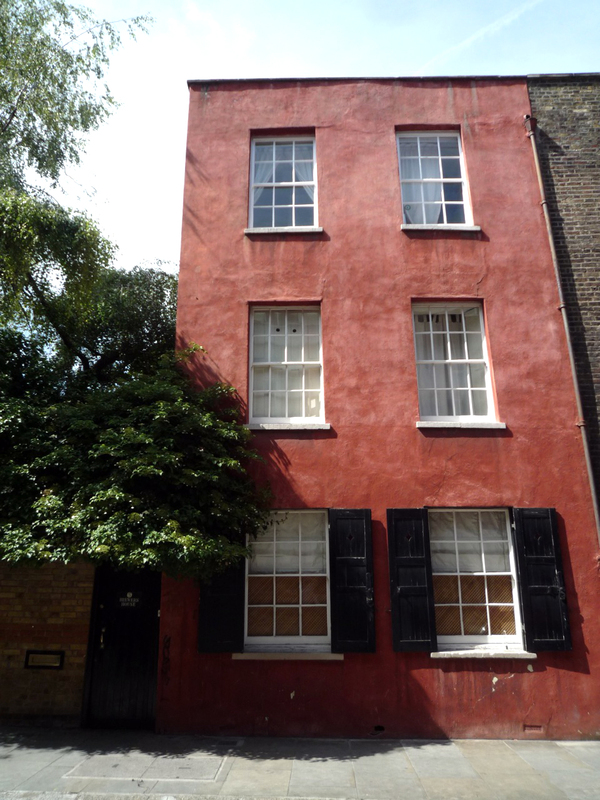 Jocasta Innes’ house – refurbished by herself, of course. Nevertheless, we were keen to see these cherished houses and enjoyed a stroll around the area, admiring the proportions and unadorned, elegant facades; lamenting the long-departed owners of empty shops; amused by Hawksmoor’s church often looming at the street-ends like an Anglican rebuke to the dissenting Huguenots. 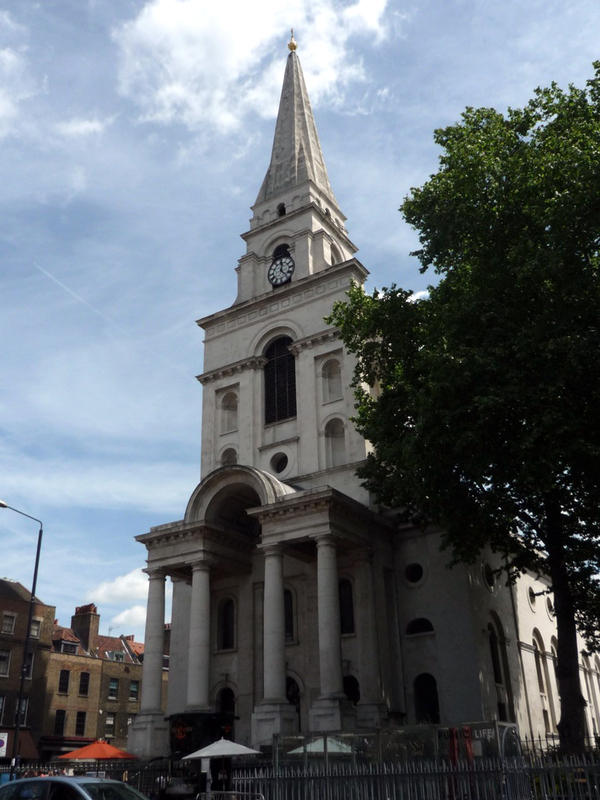 Hawksmoor’s Christ Church keeps an eye on the tastefully restored houses of Spitalfields. 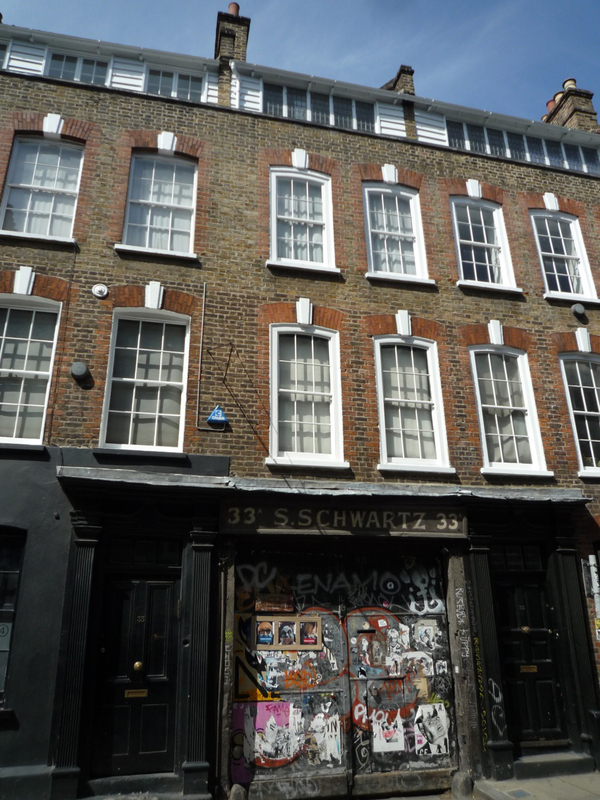 Ex shop in Fournier Street – the name Schwartz is more than likely a reflection of the once significant Jewish presence in the area. 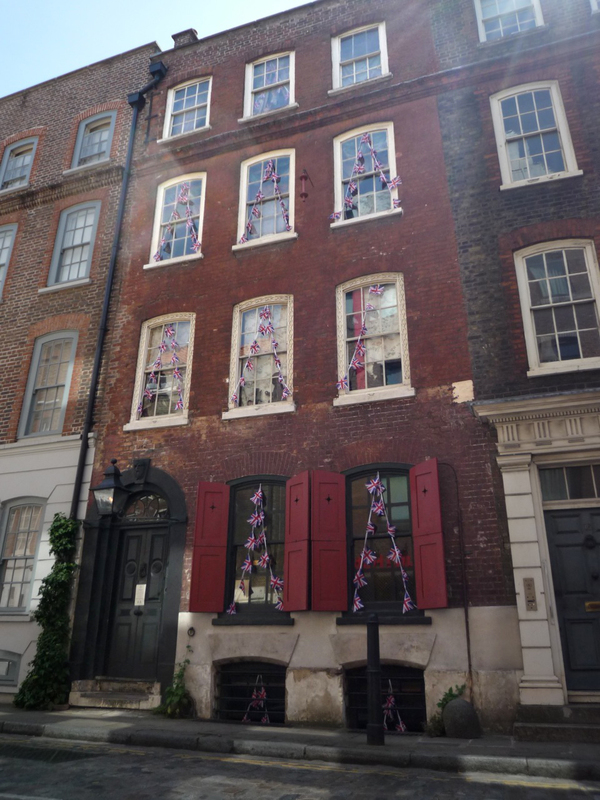 Eventually we came to a very particular weaver’s house we’d heard about in Folgate Street, occupied until his death in 1997 by artist Dennis Severs. He partially restored the house, returning it to it’s 17th century origins (it has no electricity) and transformed the interior into a ‘still-life drama’. Only a limited number of people are permitted entry at a time and you are not allowed to take photographs in the house (a painful restraint!) but you can learn more about Dennis Severs and the house here. Once inside you are given directions and requested to be silent. Visitors move from one lavishly set room to another, witnessing – through the smell of a snuffed candle, a wisp of steam from the remains of a meal, the rumpled bedclothes – the previous ‘occupants’. ‘They’ were a Huguenot family invented by Severs, who spanned three centuries, each floor invisibly inhabited by persons from the 17th to the late 19th centuries, whose intangible presence intimated stories held by the house. It is a beguilingly immersive experience – even when you know the score, it’s sensory richness and discreet stage-management provide a most satisfying hour and leaves you with enriched, if embellished, perceptions of the past, and questions about how it’s portrayed. Dennis Severs house, Folgate Street. And so we stepped back out into the dazzling 21st century and went on to other attractions but before we left we crossed the street and walked up a narrow, dead-end road opposite Dennis Severs House to look at the remains of some forbidding brick Victorian factories – a hint of other stories from the past contrasting with what had just been purveyed to us. I thought no more of this brief diversion until a few months later when, still tantalised by my grandmother-in-law’s past I found online a census record from 1901 that tallied with the few facts we had about her; it was inexplicably exciting to think that at last we may learn a little more. A large family of the surname we’d been given (that included a daughter with Grandma’s first name, and of the right age,14) were amongst the occupants in a dwelling house in a place called Blossom Street. There were 10 of them; head of household, listed as a pianoforte maker, his wife and 8 children. But there were another four families in this one house, a total of 30 people. 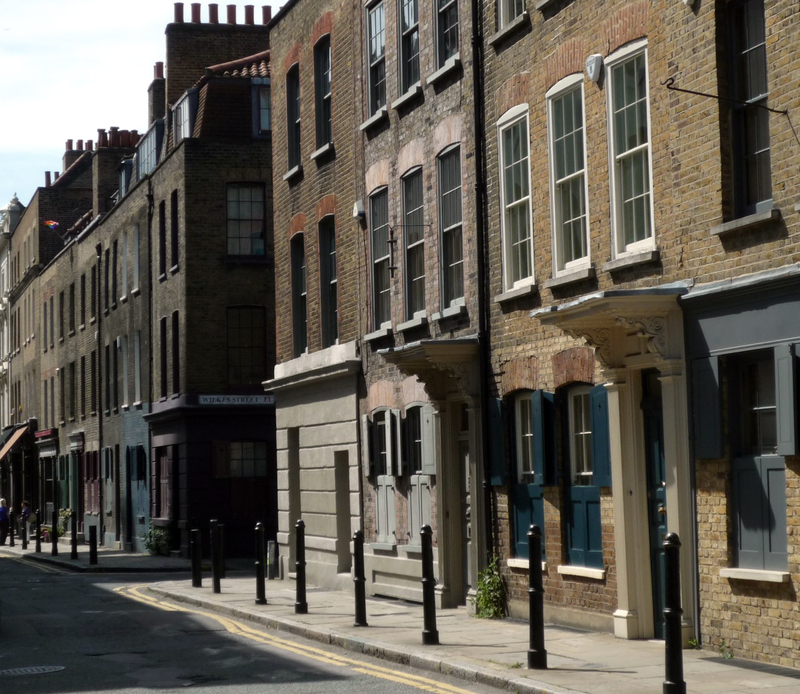 When I typed Blossom Street into Google maps, I was astounded to see that it was this narrow dingy street opposite Dennis Severs house. Further research revealed that Grandma was born in Mile End and that the family had indeed also lived in Bethnal Green where, age 24 she’d become a collar machinist in a laundry. She escaped from what must have been a very tough place to live when she married a Lee Valley nurseryman, who for a time had also moved to Bethnal Green, but they went back up the Lee to Cheshunt, where decades later we would visit her in her house near the marshes. 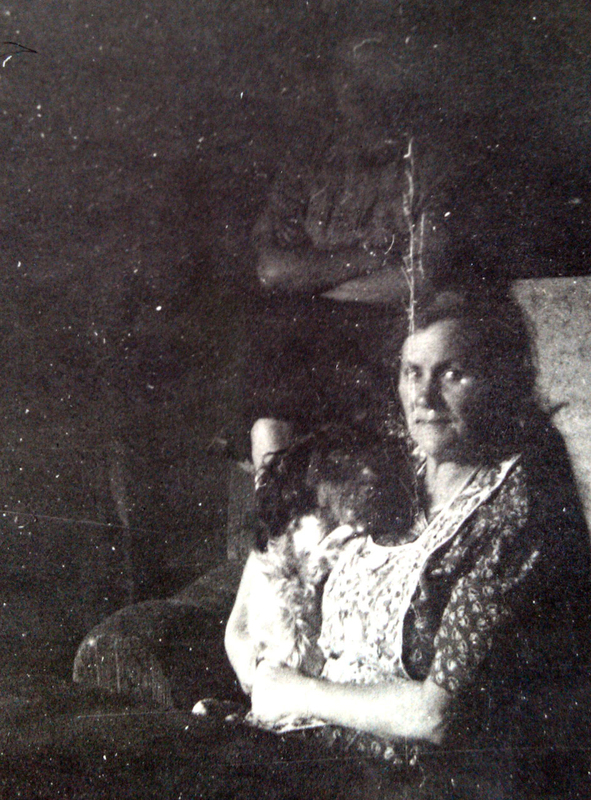 Grandmother-in-law in 1950s Cheshunt; not so far from Bethnal Green but a long way away. 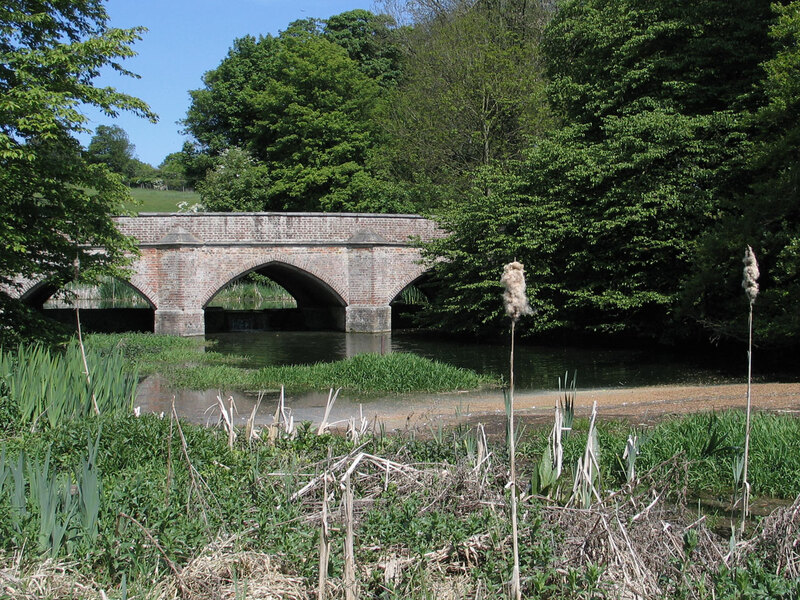 Water End in Hertfordshire – home to some of my 19th century family, a picturesque village but unsustainable for agricultural labourers, hence the departure for London. These subsequent discoveries of our ancestors’ successes and failures over half a century or so, added a temporal dimension to our day-trip to London. The families’ daily lives and efforts to survive had been played out amongst the streets we’d comfortably ambled around, and that insight threw a new light on this area. It retrospectively illuminated our experience of the place, revealing further layers, and casting shadows of ghosts from our own pasts into the present, adding a surprising depth to our idle tourist visit. Further outings to see where some of the other long-departed relatives lived now seem impossible to resist. 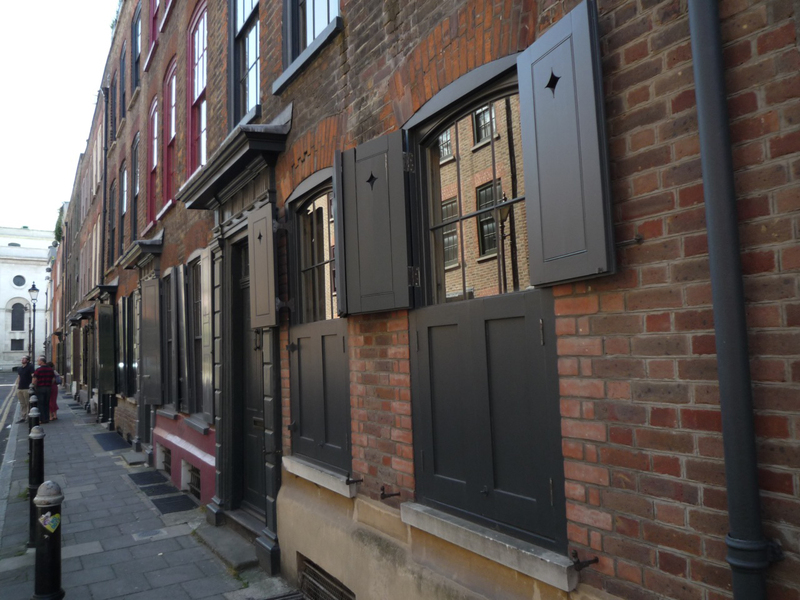 The Spitalfields area of London has such a long and rich history that there’s plenty you can read about it, but one of the most interesting sites to visit is Spitalfields Life. People of the Abyss by Jack London is available as a free Kindle download. If you type ‘Dennis Severs House’ into Google Images you can see what the inside looks like, you’ve probably seen it already on TV, it does get hired for filming. 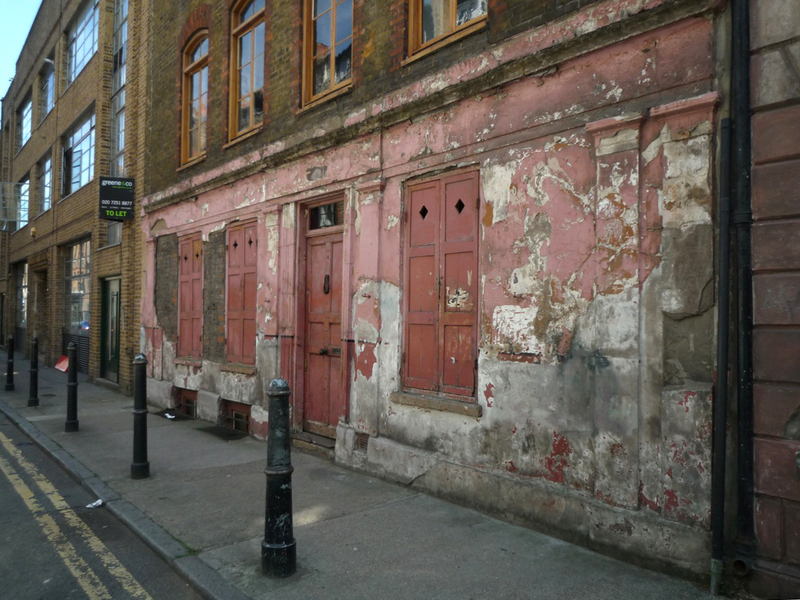 This entry was posted in Place, Ways of looking and tagged architectural features, family history, Hertfordshire, Lee Valley, markets, migration, occupations, Spitalfields. Bookmark the permalink.